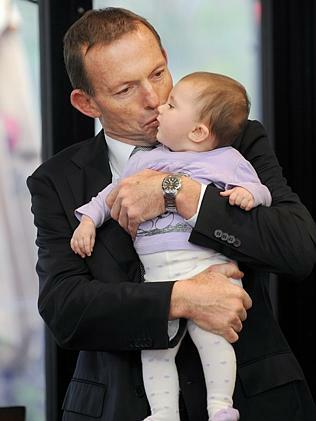 Oh baby... Tony Abbott is set ice his $20 billion Paid Parental Leave Scheme. PRIME Minister Tony Abbott’s $20 billion Paid Parental Leave Scheme is expected to be put on ice next week until the budget is back in surplus to help pay for a new family package that will focus on boosting access to childcare. Mr Abbott’s move to effectively jettison one of his signature policies, which has little support among colleagues, comes as several senior ministers conceded the political situation had become so perilous that next week was now regarded as “make or break” for his leadership. With nervous cabinet ministers now privately warning discontent among the backbenchers was potentially uncontrollable, a major shift on the PPL from the PM is regarded as a critical circuit breaker. With parliament due to resume the week after next, sources close to the PM claim he was aware of how tenuous his position was with unrest in the party room no longer confined to a small group. “He’s very aware of how important next week is,” one senior MP said. Treasurer Joe Hockey is believed to have been calling agitated Queensland MPs over the past few days urging them to calm down after their warning that today’s Queensland election — which is feared could be cataclysmic for the LNP — could be a “danger point” for Mr Abbott’s leadership.